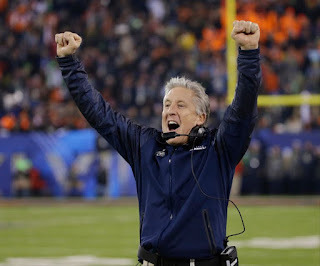 Pete Carroll, the head coach of the Seattle Seahawks, became only the third coach in football history to win a national championship in college football and a Super Bowl in the NFL, with his win in Super Bowl XLVIII. So, how did he do it? What are his secrets? More importantly, can his philosophy and approach be applied to this “game of life” we’re all in together? - Look for the best in people. Celebrate what makes each person unique. - Inspire hope. Motivate others to be their absolute best. - Follow a higher purpose. - See challenges as opportunities. Bring out the greatness in others. - Treat those closest to you like family. Make the group, the team, not the individual, the primary focus. - Be authentic. Be real. - Trust yourself. Stay true to yourself. - Focus on helping others. - Forgive others. Help others learn from their mistakes. Believe in them. Be willing to give them a second chance, wherever possible. - Visualize the success you desire. Develop a success mindset. - Have fun. Be enthusiastic. - See the bigger picture. Follow your mission. Pursue a greater good. - Overcome failures. Learn from your mistakes. - Overcome your doubts. Face your fears. What doubts did Pete Carroll need to overcome? What fears? - Embrace change. Be willing to step outside your comfort zone. Keep growing and challenging yourself. After being fired twice as a head coach in the NFL, Pete Carroll built and maintained a dynasty in college as head coach at USC, which included seven straight Pac-10 Championships, two National Championships, and 33 straight weeks at #1. But, did he settle for this? - Stay balanced and focused. Keep your successes in perspective. "One of the things that happens every so often is teams have a big fallout after they win the Super Bowl. We're not in that situation." If it could all be summed up, what’s the secret to Pete Carroll’s success? He appeals to each player’s strengths, opens their eyes to greater possibilities and challenges them to reach their potential. And, he treats them all with respect.